Get out of the arena and get better results plus a happier horse. Picture this: You and your horse have taken a break from working on dressage in the arena and have gone on a long trail ride. Your horse has been alert and forward, but loose and relaxed throughout the ride. Trotting up a hill on the home stretch, your horse goes into high gear. You feel the thrust of his hind legs well under his body, and his rounded topline collects itself like a coiled spring. He becomes light in your hands yet his movement is powerfully forward, lapping up the land between you and the barn. Exhilarated, you realize this is dressage. This is why we do dressage, you think. So we can have moments like this. Dressage can be done anywhere, says Karen Rohlf, who worked under “O” judge Anne Gribbons for 20 years, coached many horse-rider teams to Grand Prix, and later founded Dressage, Naturally. She practices dressage on trails and in open fields to get more power, relaxation, and forward energy with her horses. She finds the inspiring locations give more power to low-energy horses, and that being outside relaxes horses that get tense inside the arena. By exploring more inspiring locations for dressage training, she feels we can increase our chances of success in developing those qualities in our horses. For example, open spaces give horses a sense of freedom of movement. Riding from tree to tree or other landmark is a great way to practice straightness. Hills develop a horse’s balance. And trails motivate the horse to go forward. 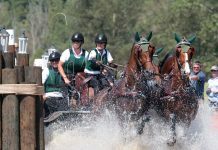 The German and British dressage teams, the gold and silver medal winners at the 2016 Rio Olympics, regularly ride their horses cross-country, points out German-trained dressage legend Walter Zettl. Carl Hester of the British team advocates riding up hills to improve wind fitness, and throwing in some jumps to keep your horse interested in his work. In his book, My Horses, My Teachers, Alois Podhajsky, a former director of the Spanish Riding School, relates the story of a horse named Nero who did not perform well when he came to Podhajsky because of an extreme lack of impulsion. Podhajsky rode the horse in nearby Prater Park, where he could take “long, straight lines,” since circles and turns dampened his impulsion. Gradually, Podhajsky introduced short sessions in the arena between rides in the park. Nero enjoyed his work outside, and his impulsion improved dramatically. 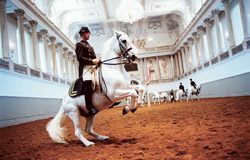 After eight months, he placed second in an international competition, and went on to win Grand Prix de Dressage in Budapest against the best talent in Europe. This example may shed light on the potential of many dressage horses today. Doing circles and serpentines in a hilly field can be extremely valuable to dressage, says Rohlf. Trails lend themselves to lateral work, Rohlf finds. If a trail is wide enough and straight enough, you can practice leg-yielding from one side to the other, haunches-in left and right, and shoulder-in left and right—all without having to turn around every 40 or 60 meters. Learning tempi flying lead changes can be easier in an open area, too. Canter-walk-canter transitions work better on the trail, too, because of the horse’s naturally forward energy. Lastly, you can use a trail to practice counting strides between transitions, such as 10 steps walk, 10 steps trot, et cetera. Here are some strategies Rohlf recommends for working up to feeling comfortable riding in the open. Figure out why it feels unsafe, then address that issue. If it’s because your horse is lonely, bring a buddy along. If he’s spooky, practice getting him more confident with scary objects in the arena. If he’s hot and needs a wall to stop him, practice stopping him in the center of the arena. Take baby steps. Practice going in and out of the arena, a little further each time. If there’s space, try riding around the outside perimeter of the arena to start with. Or trailer your horse to a quieter setting. Be choosy about who you trail ride with. Don’t go out with “yahoo” people who might not respect your wishes to slow down. Ride with someone who enjoys going the pace you’d like to go, and whose horse will have a calming influence on yours. Develop a familiar route. The more familiar your horse becomes with the territory, the less likely he is to be impulsive and inattentive to you. You can both relax if you’re not worried about what’s coming around the next corner. Don’t end the ride too soon. If you ride a hot horse long enough, he’ll finally relax, because it’s not efficient to be nervous for miles. It might mean riding a second hour at first, but with experience your horse will likely calm down sooner. Rohlf started her young PRE horse, Natilla, in the arena. When it came time to try her on the trail, Rohlf questioned whether she was ready. The mare was somewhat anxious, had a habit of looking outside the arena, and could get quite strong. But to Rohlf’s surprise, Natilla became very relaxed—apparently less claustrophobic—when ridden in a field. And this newfound relaxation carried back into the arena, where she is now totally comfortable. Corisco, a Lusitano started in Brazil, was another case. After being imported to the U.S., he was kept in a stall in a dressage barn with little turnout, and things did not go well. Karen and an assistant, Shawna, did lots of relaxation exercises with Corisco on a long rope and in the saddle—outside the arena. 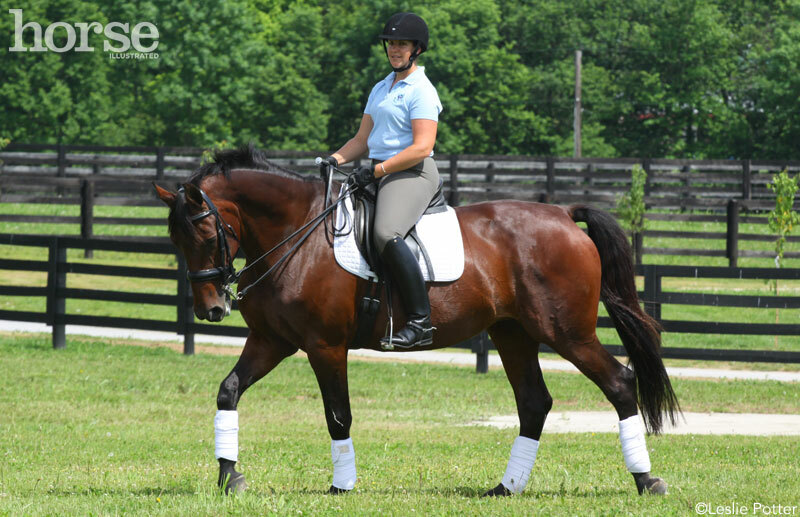 Within two weeks, Shawna was riding him in a halter, and he became the happy dream horse of a dressage student in Kentucky. That inner peace translates to relaxation and suppleness—essential building blocks on the dressage scale. 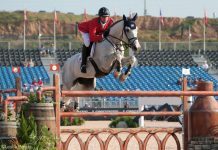 Besides keeping his mind fresh and his outlook enthusiastic, being ridden outside the arena may be just what your horse needs to improve his relaxation, impulsion, and overall dressage performance. Nancy Humphrey Case is a freelance writer living in Vermont. She enjoys doing dressage with her Welsh Cobs.